Over 80,000 customers across the globe can be found enjoying World Cat catamarans. They’ve chosen their boats because World Cat delivers a smoother, more stable, more enjoyable experience from entertaining at the dock to navigating the deepest waters. The origin of World Cat can be traced back over a quarter of a century to the beginning of their Glacier Bay Edition boats in America’s Pacific Northwest. Today, World Cat is the largest maker of power catamarans in the world. 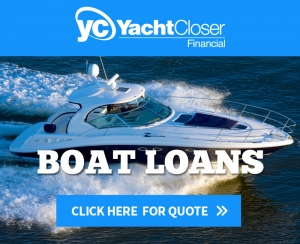 Located in Tarboro, North Carolina, their boats are precision crafted in a state-of-the-art 140,000 square foot facility. They build an array of boats in different sizes and configurations, each is a reflection of their mission; to deliver the smoothest ride on water – making boating more enjoyable and giving boaters the comfort and confidence to cruise, fish, dive, and explore the water world around them. From the South Pacific to Siberia, World Cats have safely carried thousands of boaters over tens of thousands of miles. Shouldn’t you share in that experience? World Cat’s innovative catamarans hull design delivers a smoother gentler more stable ride, without sacrificing performance and fun. They give you the confidence to handle rough waters and the capability to go greater distances, with dual systems to bring you home. World Cats have the maneuverability to turn on a dime and the ability to navigate around the dock and in shallow waters, all with the smoothest ride on the water. World Cats have the features everyone wants – comfortable cabins, remarkably spacious decks, bigger and wider bows, attractive interiors, entertainment centers, large head compartments, storage everywhere, and convenience everywhere you look. 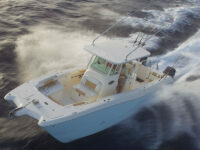 World Cats have the features a fisherman wants – greater stability, huge cockpit space, lockable rod storage, big livewells, large insulated fishboxes and a lot of rod holders. 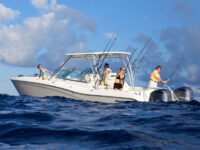 You can do it all in a World Cat – cruising, diving, exploring, fishing and entertaining. 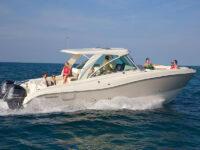 Do it all in the smoothest riding boat on the water. 93% of World Cat owners would buy a World Cat again! 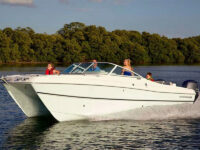 Take the Ultimate Sea Trial Today! 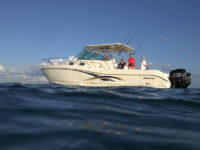 Call Boats for Sale Fort Myers at 239.481.8400 and book your sea trial today!